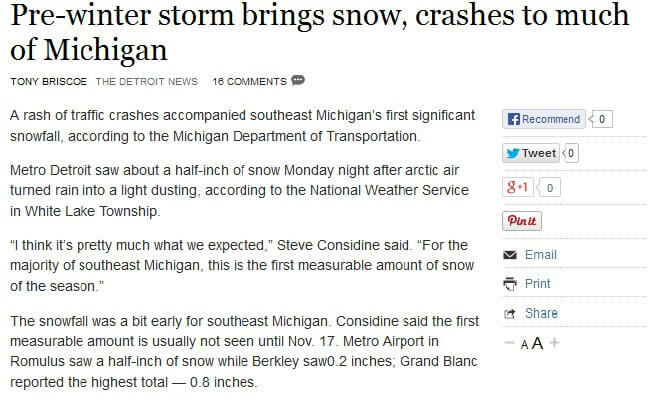 It’s no news that Detroit experiences heavy snowfall every winter. What is news though is when Detroit starts to experience winter early. 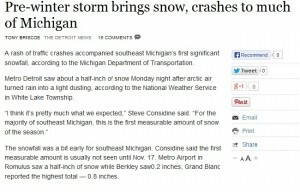 Tony Briscoe reports on the online version of The Detroit News that this year, it seems Old Man Winter jumped the gun on the winter season. A rash of traffic crashes accompanied southeast Michigan’s first significant snowfall, according to the Michigan Department of Transportation. Metro Detroit saw about a half-inch of snow Monday night after arctic air turned rain into a light dusting, according to the National Weather Service in White Lake Township. The snowfall was a bit early for southeast Michigan. Considine said the first measurable amount is usually not seen until Nov. 17. Metro Airport in Romulus saw a half-inch of snow while Berkley saw0.2 inches; Grand Blanc reported the highest total — 0.8 inches. After a snowfall, it’s critical for homeowners to remove snow from their roofs to avoid the formation of ice dams, which can cause an advanced deterioration of roofing systems. However, roofs that have already been badly damaged may not benefit much from snow removal, except as a quick fix to prevent leaks. In situations like this, a new roof may likely already be in order. Having a new roof installed, however, does not always guarantee getting the best protection for the home, especially during a harsh winter. A newly installed roof that lack the proper amount of fasteners, for instance, can be in danger of failing during snowstorms and hailstorms. For this reason, homeowners must turn to roofing contractors in Detroit who are experienced in quality roof installation. A good indication of a roofing company’s reliability is a certification from leading manufacturers of roofing products like Owens Corning. Such a certification is given only to qualified contractors who meet the manufacturers’ rigid screening standards, and whose crew has undergone the necessary training for installing the manufacturers’ products. At one point or another, homeowners will find themselves in need of a new roof. Sometimes, the harsh winter conditions, especially in Detroit, may hasten this need and make it more urgent. Homeowners should keep in mind, though, that a new roof can fail if installed shoddily. Thus, for quality Detroit roofing installation, it is best to hire the services of reputable roofing companies with the right factory certifications, like Kroll Construction.